It’s cicada time! They are an every year occurrence here. They actually started about two weeks ago when the weather turned horribly hot again and have been going strong ever since. They are so loud they almost drown out the chirping of the crickets. And they just go and go and go. It sounds rather like all my neighbors are out in their garages working with power tools and have just left them running all day. It could really be a form of torture, but the cicadas are kind enough to keep a pretty even pitch and a near constant tempo so they more or less become white noise in the background. We have also hit the seasonal transition between summer and fall in which we have a couple of really hot days –summer! –then a cool day or two –fall! — and then hot again and then cool and then, you get the picture. Right now there are still more hot days than cool, but the hours of daylight are shorter and shorter, the angle of the sun lower, and the nights cool off a bit. Eventually we will tip to more cool days than hot. I can hardly wait! 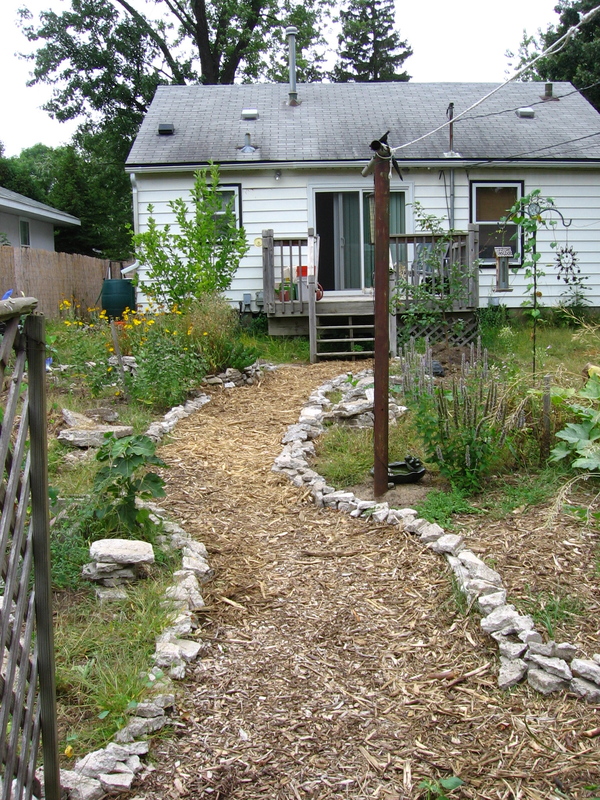 On a couple of cool days this last week Bookman and I managed to finally finish our new garden path. We had just enough wood chips stockpiled too. The path edging is made up of the concrete we took up from the crumbling path that we had. We broke it up into smaller pieces and it worked out quite nicely. We have some leftover that we need to clean up and a small hole to fill where the sidewalk used to be but our new path did not go over that spot. We will use the leftover concrete bits next year for edging garden beds and smaller branching paths through the garden. We decided to leave out big stepping stones in the wood chips because they wobbled a little and it made Bookman feel unsteady. The squirrels love the wood chip path. Every morning I walk out on it and find places where they have dug a little hole to hide a bit of something in for winter. mention a study that found bumblebees do best with less pavement and more floral diversity. Since bumblebees nest in the ground, less pavement seems like a no brainer. But, as another article I found reveals, there isn’t a lot of plant diversity in cities. Bees do best with a large diversity of flowers. They will fly very far to find food and when they find a good place will return again and again. Unfortunately, due very likely to big-box garden centers all selling the same thing, we aren’t giving bees or other pollinators much to be really happy about. I was very sad to see that Minneapolis and St. Paul were part of the plant diversity study. We are very garden friendly in Minneapolis. We are allowed to plant that strip of grass between the street and the sidewalk with flowers, we can rip out our lawns completely, we can turn our gardens into urban farms even. But yet we lack plant diversity. I didn’t want to believe it so I’ve been doing an informal survey of my own of front yards I pass to and from work and while running errands. I quickly got depressed because once I began paying attention I realized that yup, the study is right. Everyone has ferns, hostas, black-eyed susans, coneflowers, phlox, and a small variety of shrubs. To be sure, there are some gardens with more variety but not many. Oh dear. Besides the big-box garden centers where I do not shop except for extra bags of compost or tools, never plants, I also think garden advice magazines are to blame. You read them and they all say to choose a small variety of plants and plant lots of them in wide swaths because it is more pleasing to the eye and doesn’t look messy. It also doesn’t help that so many people still cling to the idea of the perfect lawn. But lawns are monocultures that do not bring bees or birds or anything beneficial to the garden. And as for growing only a few variety of plants to keep the garden from looking messy, well, gardens are messy things, they should be messy if you are doing it right. Having a row of the same shrub at the house’s foundation fronted by an edging of vinca or pansies with a ring of hostas under the shade tree, well, that’s sterile and boring in my opinion. It makes me ever more determined to strive for diversity in my garden. Mine will be an oasis for the bumblebees. Speaking of bumblebees, they are very happy right now because the asters have started blooming. 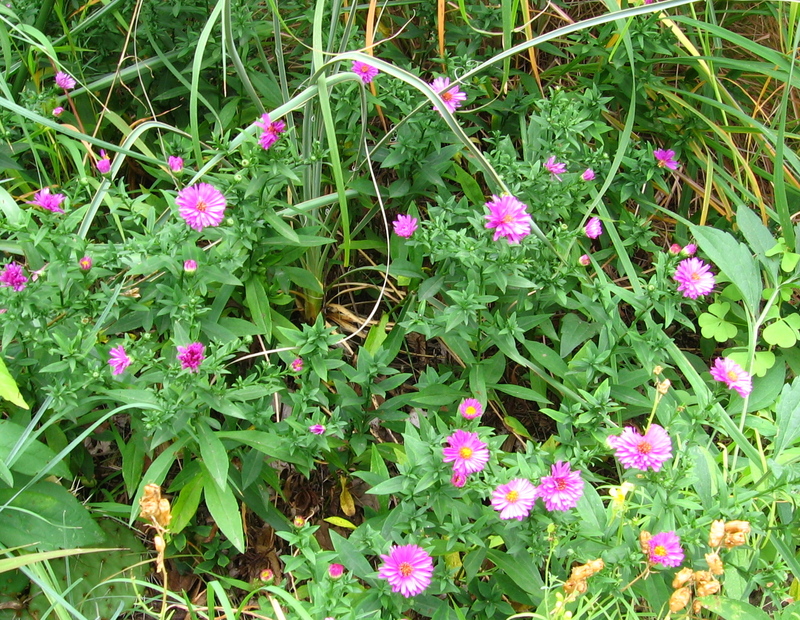 I have a short, purple-pink alpine aster and a tall pale purple New England aster. 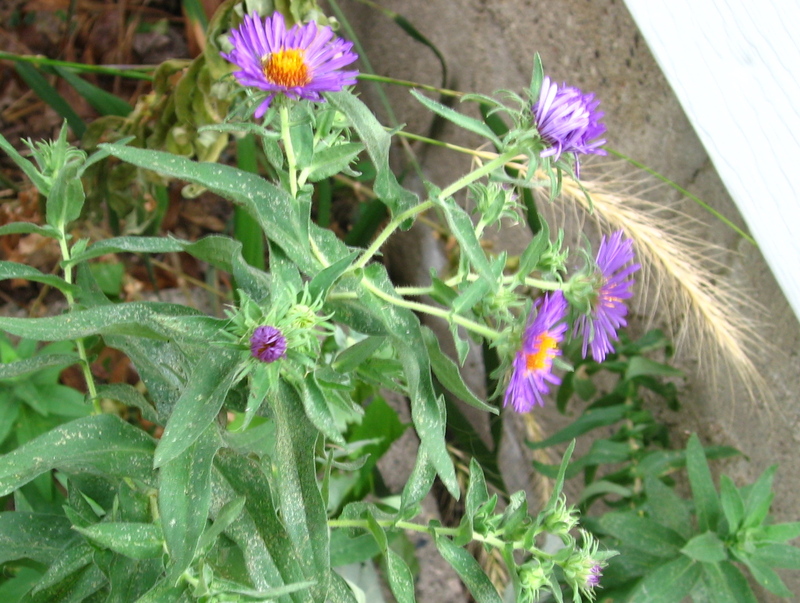 The New England aster is usually a monster but the heat and drought have gotten to it and scorched much of it which makes me a bit sad. And even though the autumn joy sedum flowers aren’t open yet the bees are doing their best to get at the pollen in them. The plant is just starting to blush pink. I should think that by the end of the week the flowers will be opening. Then let the bee party begin. I got a small bowl of beans out of the garden this week but the heatwave last week did them all in. This bowl was the last. There are a few more zucchini most likely. We will get three bell peppers. We have a number of green tomatoes that don’t seem to want to turn red. And the pumpkin vines continue to be scorched in the sun. The good news is that most of them have turned orange so if the vines die we will still have pumpkins. I don’t know if I will be able to leave them out until frost to sweeten them up though. It’s going to be a close call. The heat has also caused Bossy and Bingo to continue to drop apples. They still have a lot but it won’t be the blockbuster year we thought it was going to be. Very likely we will be able to start picking apples next weekend or soon after. Then comes the peeling and coring and the cooking down to make apple butter and apple sauce. And yes, apple pie. Oh I can hardly wait! Speaking of pie, I almost forgot. Early in the week on a cool day Bookman thawed out some of the tart cherries from our neighbor’s tree we had in our freezer and baked a cherry pie. Oh. My. Goodness. Coupled with homemade vegan vanilla ice cream, heaven, pure heaven. You are still doing a wonderful job really–I haven’t a single flower in my yard and only tired old bushes that have a very short blooming phase in spring. 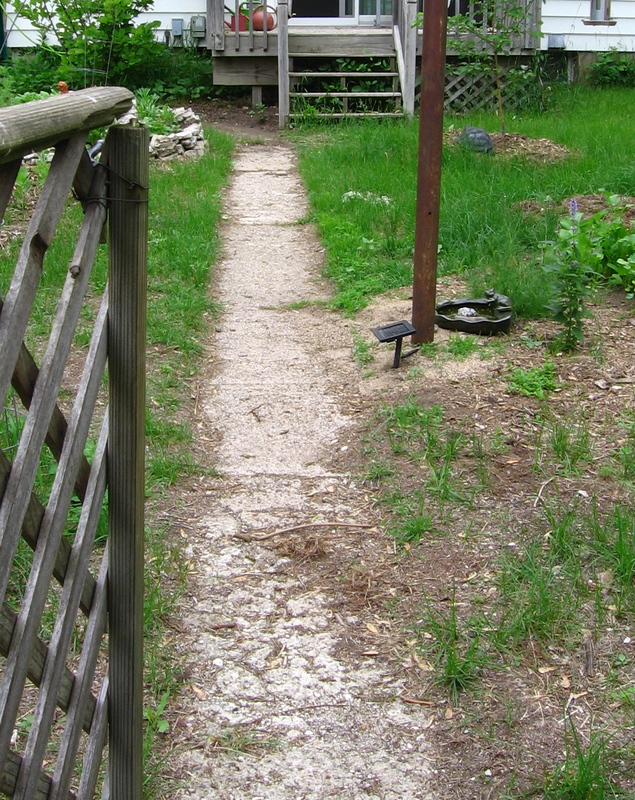 I love your garden path–it turned out great! And I personally am fed up with the heat. It has been all hot days and no cool ones for a few weeks now and I am ready for a little relief. Today will be close to 100 and then I hear by Friday it should be closer to normal in the low 80s. Heat makes me cranky as it gets so hot in my house and makes my A/C (already old) work harder–the fuse flipped three times yesterday and I had to keep watching it as it just overheats. The joys of living in the midwest and humidity! You’ll have to share photos of your apples! And are you already planning next year’s garden? I agree with Danielle, the garden path looks wonderful. I heard on the news today that you were going to have another scorcher and thought of you. But it’s supposed to cool down by the end of the week, so take heart. We pretty much stay in the 80s. The island is a micro-climate that differs from Savannah itself by sometimes as much as 8 degrees. It can pour rain downtown and we stay dry and vice versa. Something to do with the closeness of the ocean and all that. You have much nicer autumns than we do. I think I’ll try growing some lettuce this fall. My summer garden was pretty much a bust. Grad, thanks! Yup, it got hot but thankfully not as hot as the forecast predicted. It must be nice that your summer weather, though too warm for my preference, is pretty steady and predictable. Autumn here is a gorgeous season. It’s been so warm none of the trees have begun changing color yet but I imagine it won’t be long now. I planted some radishes in July hoping to have some again by now but the dry and the heat is making me start to wonder if I will get any since they are only about two inches tall.